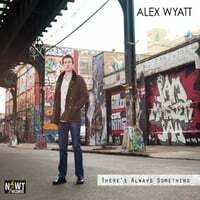 Composer and drummer Alex Wyatt takes you on a journey of the imagination with this evocative, thoughtful instrumental record. Think Norah Jones meets Charles Mingus. For much of the material on the record, Wyatt was influenced by colleagues and contemporaries. Combining his traditional jazz training and ethos with contemporary folk and rock sensibilities, he comes up with a unique set of song-like tunes with jazz forms. Certain melodies are reminiscent of the indie folk band Cuddle Magic, with a minimalist yet heartfelt mood suggestive of Norah Jones. Wyatt also took some influence from composer Ben Gallina, in whose electric chamber jazz group, SALO, he drums. Other influences include composer Jesse Elder, Thelonious Monk, Lennie Tristano, and Dave Holland. Blending this narrative compositional style with a healthy amount of improvisation, Alex is joined by a stellar sextet of up-and-coming New York jazz phenoms. Besides Chris Tordini on bass, joining Wyatt is Greg Ruggiero, whose two successful albums for Fresh Sound, New Talent, have established him as a go-to guitarist and composer for anyone looking for unmatched sound and melodic sensibility. Rounding out the rhythm section is Danny Fox on piano, of Danny Fox Trio notoriety. Completing the sextet are the in-demand saxophonists Kyle Wilson and Masahiro Yamamoto, playing tenor and alto, respectively.